WBZ reports a Boston firefighter who claims he was injured in a fatal 2016 fire on Babson Street in Mattapan has dropped his negligence lawsuit against the dentist who owned the house after the station reported the city was continuing to pay the firefighter's salary and medical expenses - as required by state law. Samuel Perez Rosado, 38, was arraigned today on charges he abused and raped "a child known to him" for several years, the Suffolk County District Attorney's office reports. Read more. WCVB reports a Boston firefighter is free on personal recognizance after his arraignment earlier this month on charges he tried to kiss a woman, then pulled her pants down, exposed himself and pushed her onto a couch before she fled. Read more. WCVB reports one of the posts involved "involved a cartoon man carrying a decapitated head with the caption 'Nat Turner's slave rebellion.' " A police officer now stands guard outside BFD headquarters just in case. Kat Kirpatrick holds a baby rabbit outside the Union Square fire station today, reports she put it back down. Sean Olson, a firefighter at the station, reports: Read more. Pittsburgh Fire Chief Darryl Jones yesterday made good on a bet he made with Boston Fire Commissioner Joe Finn before the Patriots/Steelers AFC championship game. At-large Councilor Annissa Essaibi-George says she's had enough with suburban parents who try to sneak their kids into Boston public schools - and no longer just the exam schools, but even pre-school, inclusion and special-ed programs. At-large Councilor Michael Flaherty, meanwhile, is venting similar ire against suburbanites - and even people from New Hampshire - who use "mattress addresses" to get on the civil-service lists for jobs as Boston police officers and firefighters. Read more. Penny Cherubino happened on this scene at Commonwealth Avenue and Dartmouth Street around 11:45 a.m., reports that ten cars were hit - or damaged in a chain reaction among parked vehicles. Read more. WCVB reports on a criminal investigating involving "overtime costs, payments to vendors and billing, missing property, and missing maintenance and inspection records" and that seven years after poor maintenance led to the death of Lt. Kevin Kelley, firetruck maintenance in Boston has, at best, not gotten any better. 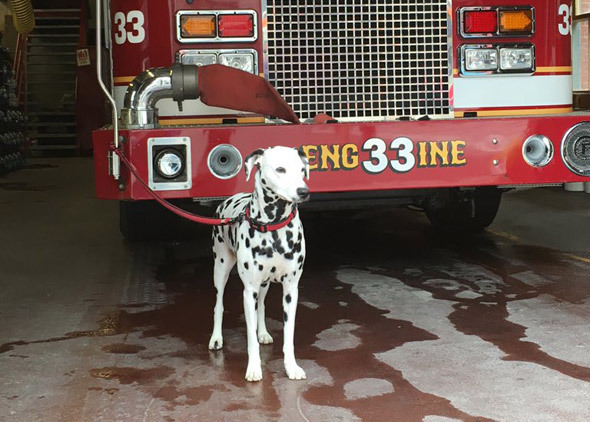 Jimmy Ellis spotted this fire dog standing guard at Engine 33 on Boylston Street this morning. City officials are looking to amend decades-old fire codes that require the use of carcinogenic flame retardants on furniture sold in Boston, saying new fire-prevention measures mean the chemicals are no longer needed. Read more. WBZ reports now retired firefighter Fred Ellis is scheduled for arraignment later this month for a case in which the driver called 911 to report his mishap and Ellis called him back a few minutes later to order him to hire a pal's hazmat cleanup team or face arrest. The boot and its base before the theft. Photo by BFD. 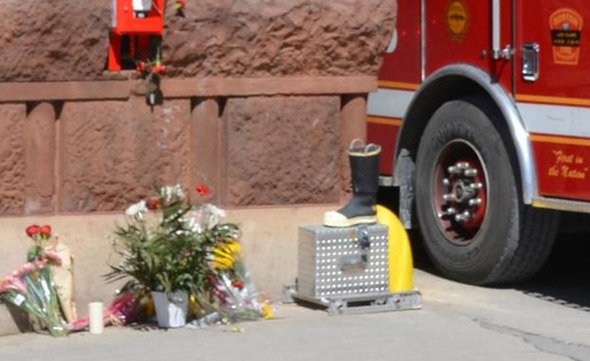 WCVB reports somebody put some work into stealing the boot, outside Engine 33 and Ladder 15 on Boylston Street - it weighs more than 50 pounds and was bolted to the ground. 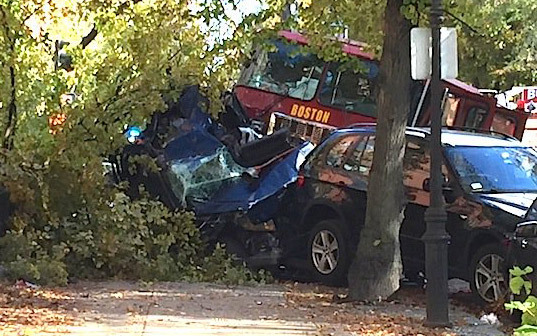 Seems people are asking the Boston Fire Department why firefighters didn't just smash up that car parked next to a hydrant at the Rutland Street fire this morning, like they did in April at an East Boston fire. A BFD district chief formerly in charge of procurement got a vendor to buy stuff for his own personal use, including a 52-inch HD TV, a gas grill, a living-room set, an elliptical machine and gift cards for Home Depot and Lowe, according to a 10-count indictment handed down by a Suffolk County grand jury today. Why did the chickens cross the bridge? BFD recruits round up chickens on Long Island. Photo by BFD. Shelter residents and workers weren't the only ones affected by this week's shutdown of the Long Island Bridge. The Boston Fire Department reports its recruits, who train on neighboring Moon Island, were pressed into service today to rescue 17 chickens at the Boston Public Health Commission's farm on Long Island. Yes, the chickens were evasive.